This fisheye lens is becoming very popular amongst the community of virtual imaging panographers. 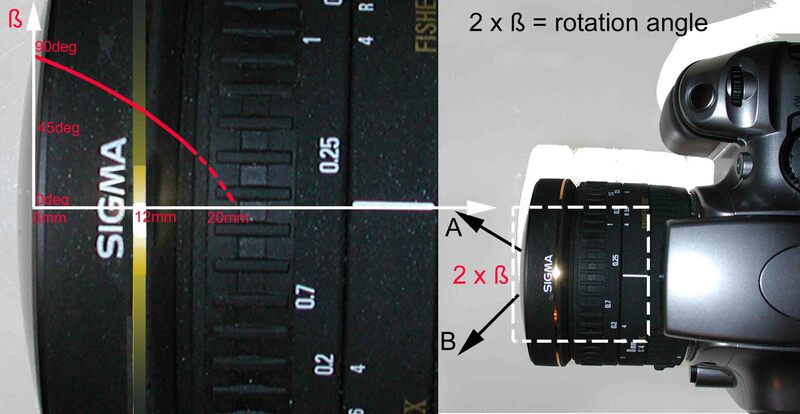 On a 35mm camera, its image circle has 180degrees as a field of view. The same is true for a full 35mm sensor size in a Digtal Single Lens Reflex camera. Its optical qualities are quite good and numerous pages can be found on the web that gives informations on its abling properties. The smaller sensor of numerous present DSLR does not cover the full circle of this lens and the image is cropped along both longer sides of the rectangle. But as the length of the CCD or the CMOS sensor is equal or higher than 22mm, the complete 180degrees FOV is captured along that direction. A full immersive sherical panorama can then be captured by shooting in portrait mode a number of images (generally four to six) that shall more than cover the 360degrees of the horizontal plane. Two objects (one close to the lens and another much farther away) are aligned with the Nodal Point when they are seen no to move (looking through the lens) one from the other when the lens is rotated arount this point. Accurate rotation around this point is mandatory in order not to get parallax errors while stitching the individual images together. This is particularely true for VERY close range panorama (have a look here). For more common (landscape or large house interior) panoramas these errors are generally not very bothersome. A very simple experiment can be used for that: the lens can be tested alone and there is no need for a camera. 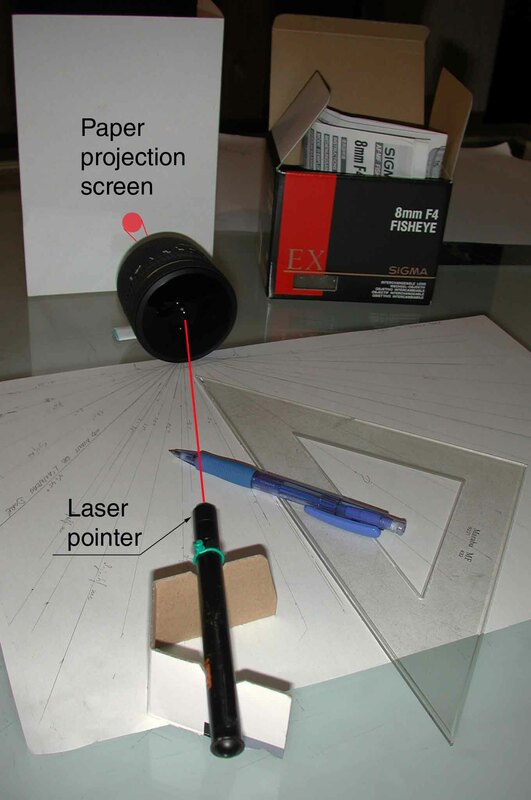 A laser pointer and a square are the only pieces of equipment that are required and that could not possibly be in your drawers already ;-) A piece of folded cardboard holds the pointer. The square is used to record the trace or the laser beam on the piece of paper. See this photo of the experimental set-up. A very bright image (cicular red area) of the laser through the pupil appears on the projection screen when and only when the laser is aimed at the Nodal Point. All the 180deg angle sector is then explored as can be seen on the photo. As shown on this graph, the Nodal Point for ß=90deg is right at the level of the limit of the front glass lens and of the front metallic ring. For ß=0deg it is then located about 20mm further back toward the camera.